Victoria Falls rituals have many shrines. The power, the allure and the myth of the waterfalls are a natural destination for mystic and ritual safaris. And who knows better but the people of Mukuni called Toka-Leya. They’ve lived around the Victoria Falls from time immemorial. They call the falls "Mosi-Oa-Tunya", which literally translates to the “smoke that thunders.” And it does thunder what with all that 545 million cubic litres of water cascading over a 1700 metre stretch and dropping 111metres. The thunder is inevitable and the continuous rain and the mist are alluring. The Toka Leya also know the falls by another lovely name "Shungu Mtitima"
Living so close to the Victoria Falls the Toka–Leya understand the waterfall better. And revere it too. As a result a number of shrines have been created for different purposes, including prayer and sacrifice. This stems from the belief that a number of spirits live around the falls area. They don’t just admire the beauty of the place but the Leyas know the hidden myths and folklore of this sacred place. 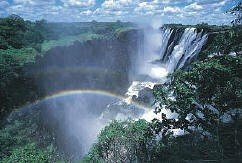 Find out about the myths of the Victoria Falls Rainbows . Visiting the falls 20 years after the discovery by Dr. David Livingstone, Mr Coillard recorded in his dairy that the local people believe the, "waterfalls was haunted by a malevolent and cruel divinity. They made offerings to conciliate its favour." Chief Mukuni explains that one of the shrines is "Nsambalwa" located about 400 metres southwest of the Sun Hotel just where Zesco Company own an hydroelectric power plant. The shrine was used for cleansing activities including sickness. "Bedyango" a Toka-Leya high priestess exercise a high ritual influence on the land. She performs rituals to avert disaster during wars, drought or epidemic. She officiated and still does, during births, marriages and deaths. Bedyango has a final say on the choice of a new chief. Talk of absolute power! The safari luxury boat, the "African Queen", is named after her and she blesses it every year on its anniversary. And guess what? The general manager of the company that runs the African Queen, Daan Brink, is also blessed to have a long life. Bedyango makes rain rituals during the yearly Lwiindi Ceremony of the Toka-Leya. Young men of about 17 years wanting to prove they are real men take a challenge of collecting water from the Boiling Pot. This is a place where the water from the falls drops with violent, ferocious whirlpool. Its very dangerous in January when there is a lot of water. As part of the challenge the young men also collect clay from the riverbed. These young men known as "Basilombelombe" take on another challenge. They draw water for the ceremony from a place called "Chisamu Chilikumbede" located at the lip above the falls. It’s one of the most important sites and used regularly. When the young men return to the village they are met by a group of marriage-age girls who take their pick from the "Basilombelombe" for husbands. "Chiposyo" also known as the Boiling Pot is an important site to Mukuni people for a different ceremony. The water taken from there is used in a ritual of placating ancestral spirits. They become angry for one reason or another. It’s a way of life! Yet another spiritual shrine at Victoria Falls is "Katola Buseka" located at the Bunji Jump spot. This spirit is house in one of the most valued shrines of the Leyas. In the past only offerings of highly valued possessions were conducted here to placate ancestral spirits and to ask for blessings. Only cheerful givers are encouraged to give offerings otherwise they risk being swallowed up. To approach any of these spirits one has to visit the "Ampemba", the white powder-smearing site at "Chizabingo". This is 7 kilometres south of Sun Hotels. The ritual warriors and those taking part in the Lwiindi Ceremony smear white powder known as "mpemba". The white powder symbolizes purity of the performers as they come in the presence of the spirits. One other important site in the Victoria Falls area is called "Kwasamukale" where one of the top most shrines in the whole chiefdom is located. The first Chief Mukuni negotiated his entry into the modern Mukuni Village at this site. It is located east of the Sun Hotels and hosts the celebration of the monarch’s memorial day. Here, the stairs have been constructed each set representing a reigning monarch including the current one. The stairs remind the present ruler about the reigning monarchs before him. It is at this site that during the Lwiindi Ceremony the reigning chief is shown the chiefdom’s wealth and partakes the tastes of some. There are many other rituals that take place here. Siloka Island is the largest island at the falls. It simply "leans over" the falls as it “sits” at the lip. The first chief Mukuni Siloka established his village here and he was buried on the island. It’s therefore a revered site for prayers and other rituals. The rich Toka-Leya myths and rituals are typical of African art and beliefs.